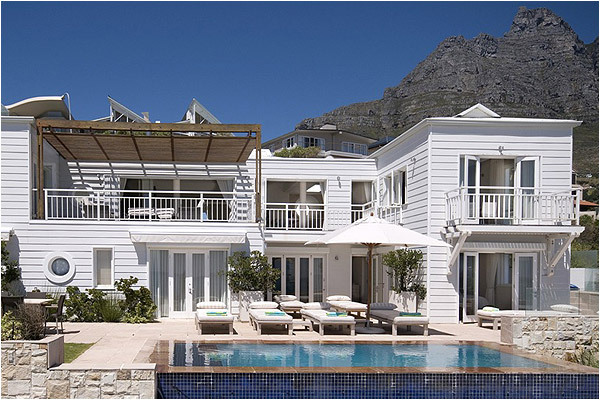 Why stay at CAMPS BAY BEACH VILLA? 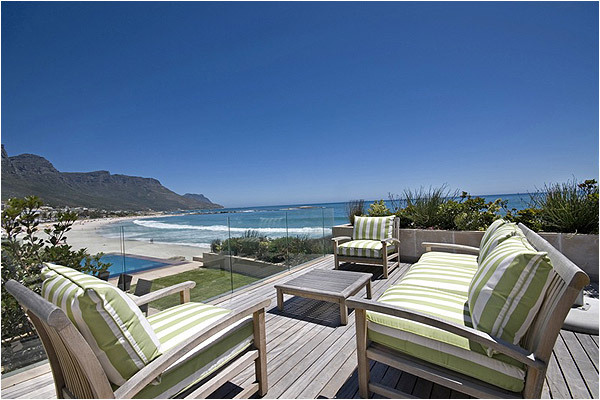 The exclusive, luxury villa, Camps Bay Beach Villa boasts one of the best locations in Cape Town. 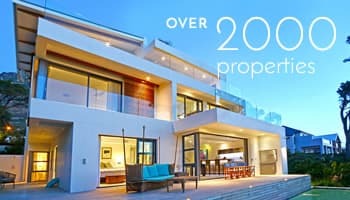 It is situated on the beachfront with impressive views of the Twelve Apostles mountain range, and spectacular panoramic views of Camps Bay Beach to Glen Beach. 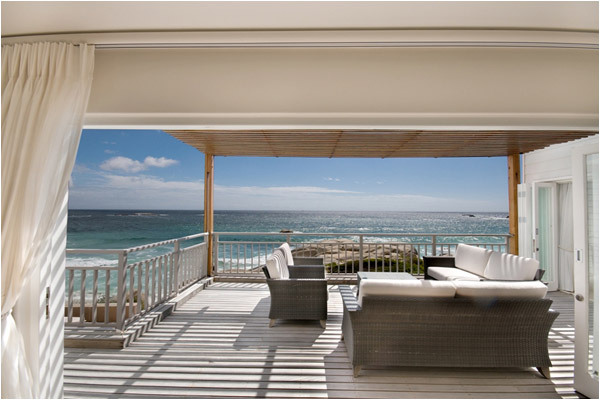 There is direct access to Camps Bay beach from the swimming pool area. 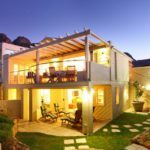 The stylish and modern four bedroom South African villa, with three and a half bathrooms, is spread over two stories and 540 square meters. 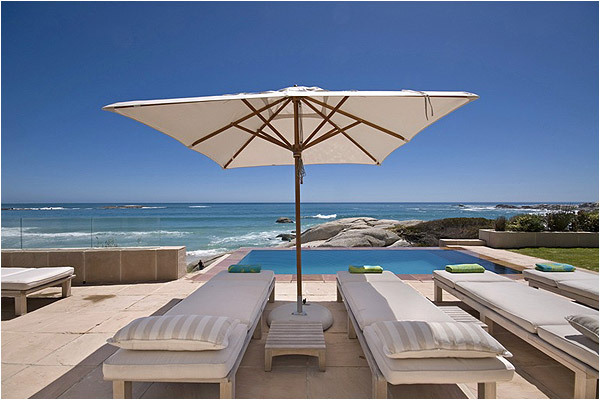 Additionally, the villa is equipped with a beautiful outdoor heated pool and deck, as well as BBQ area and outdoor dining table overlooking Camps Bay Beach and Glen Beach. The villa has been decorated by a well known local designer and features displays by up and coming artists. 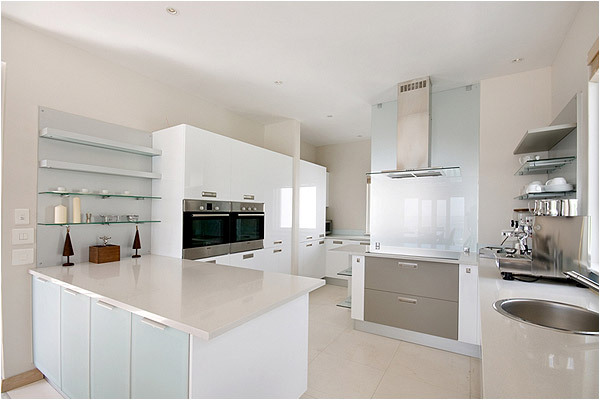 Guests are provided with two permanent staff members and a chef can be supplied at an extra cost. Entering from the pool deck leads you to the large television lounge and the four bedrooms. The main bedroom has a queen-size bed, dressing room and large bathroom. 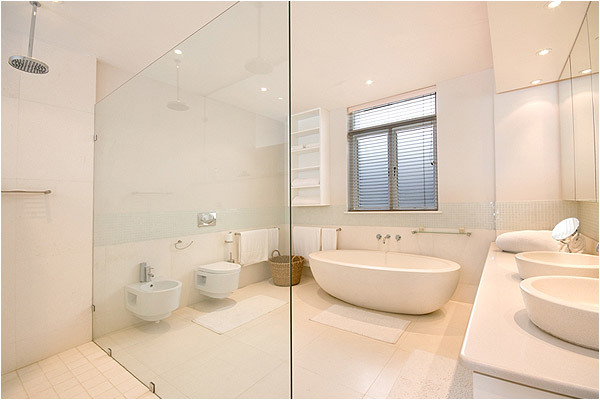 The master bathroom is fitted with a bidet, toilet, twin glass bowl sinks, oval shaped bathtub, and twin rain forest shower. 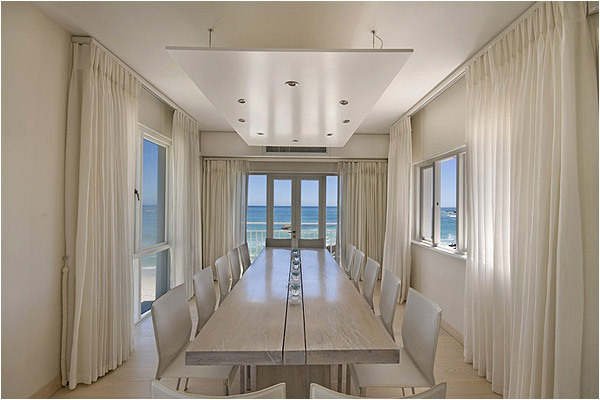 Two large glass doors facing the pool area and a large window overlooking Camps Bay Beach offer spectacular views of the surrounding area. The second bedroom has a twin-bed with en suite bathroom, which features both tub and shower. Both the third and fourth bedrooms (one twin, one double) lead to the outdoor pool deck with views of the bay, which can be seen from the comfort of every bed. They share a large bathroom with bath and separate shower. An impressive swimming pool is surrounded by a fully furnished decked lounging area, featuring 8 lounge chairs and a comfortable outdoor sofa and chairs near the BBQ. The (gas) BBQ is built-in, with a bar fridge, and cupboards. The villa benefits from a state of the art security system, sound system, internet connection and phone line available for local calls. Main Bedroom – Double Bedroom, en-suite bathroom, dressing room, television, opens onto swimming pool deck with impressive sea views. Bedroom – Double Bedroom, opens onto outside area with impressive sea views. Bedroom – Twin Bedroom, opens onto outside area with impressive sea views. 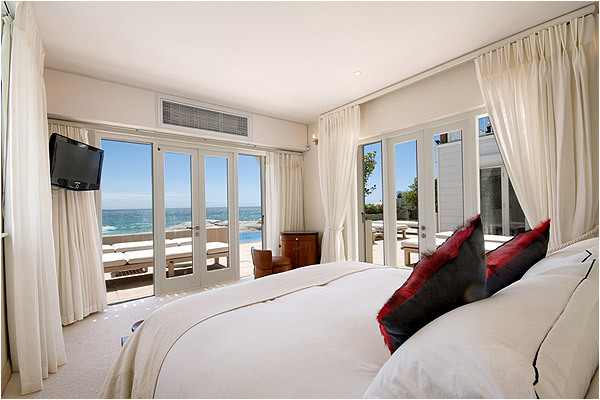 Bedroom – Twin Bedroom, en-suite bath and shower, opens onto outside area with impressive sea views. Shared Bathroom – with bath and shower. Lounge Area – with entertainment system, opens onto outside area. 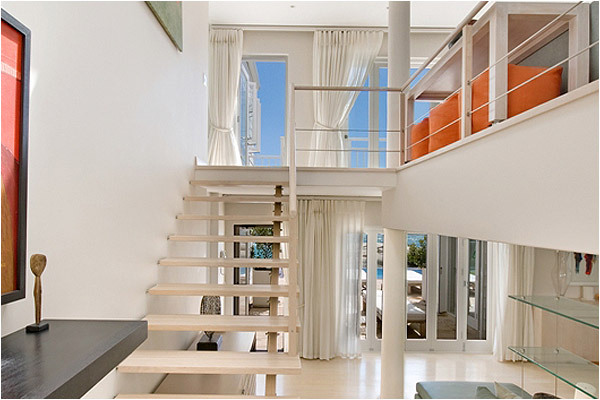 Open-plan kitchen and lounge opening onto an upstairs deck with impressive sea views and views of Camps Bay Beach. Dining Area – seats 14, opens onto outside deck, with impressive sea views. 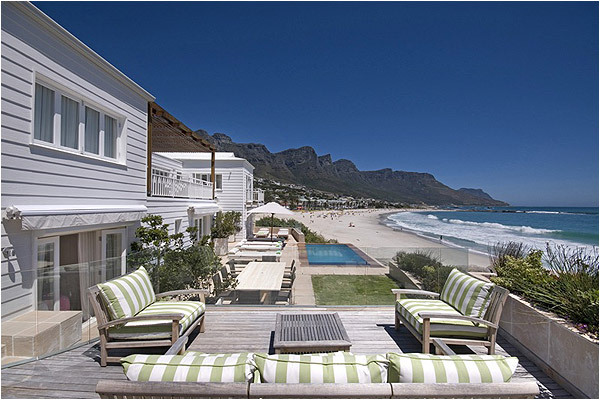 Ready to stay at CAMPS BAY BEACH VILLA?